Hang up your coats and dust off your dancing shoes as DJ Rene, “The Frenchman”, takes to the decks at The 41! 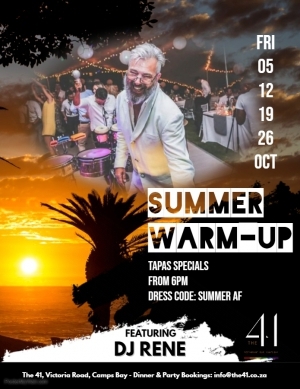 The summer warm-up sessions will offer a scrumptious Sunset Tapas Platter for R99 to share which includes Smoked Red Pepper Hummus with flatbread, Potato & Parmesan Churros with Chipotle Mayo and Crispy Squid with Sriracha Aioli. Guests will also receive a complimentary Hendricks Litchi Tonic welcoming drink.